Although wording is unlimited, please be considerate of the plaque size. Not all wording may fit. 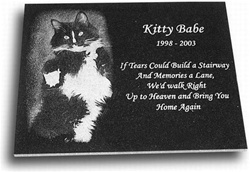 Utilizing laser technology and the loving image of a beloved pet, these granite tiles are the perfect memorial for your own pet or to be given as a gift. Durable black granite tiles are used which makes them ideal for indoor or outdoor use. Choose from 4 different font styles and unlimited wording (space providing) to personalize your loving pet's memorial. Each completed laser etched photo plaque is carefully packaged for a safe delivery to your front door. Tile Dimensions: 12" x 8" x 3/8"
ALWAYS - submit original photographs, or raw data from your digital camera. REMEMBER - that even though a copy may look good enough to you, our professional equipment sees things that the human eye cannot. Inadequate submissions drastically reduce the quality of the finished product. Our goal is to help you to get the best possible reproduction of your beloved pet. 1. If sending a hardcopy, print a copy of your order to send along with the picture. You will receive the original back. Must have a resolution of NO LESS than 300 dpi. The image size must be at least 4" x 6"
3. Make certain to include any special instructions you may require (we will try our best to accommodate them). If there any conflicts with the layout you will be notified.